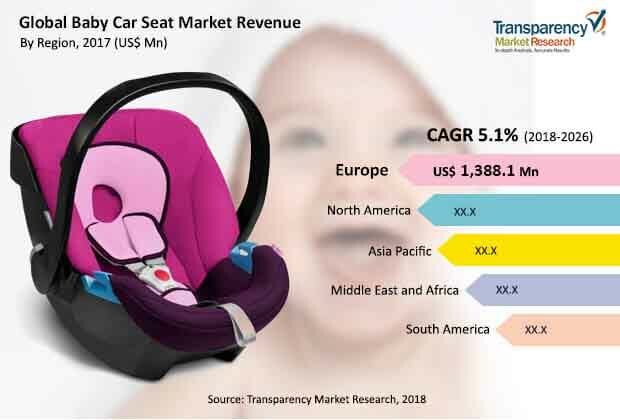 Transparency Market Research has published a new report titled “Baby Car Seat Market [Product Type - Infant Seats, Booster Seats, Combination Seats, and Convertible Seats; Distribution Channel - Online and Offline (Supermarkets and Hypermarkets, Specialty Stores, and Others)] – Global Industry Analysis, Size, Share, Growth, Trends, and Forecast, 2018 – 2026”, According to the report, the global baby car seat market is expected to reach a value of US$ 6,223.6 Mn by 2026. The market is estimated to expand at a CAGR of 5.1% from 2018 to 2026. In terms of volume, the market is anticipated to expand at a growth rate of 4.7% during the forecast period. The baby car seat market in Asia Pacific is projected to expand at the highest growth rate during forecast period. Rise in the number of car accidents involving children is increasing demand for baby car seats. Baby car seats safeguard infants and children from fatality during accidents. Seat belts provided in the car cannot be used for children or infants, as these do not provide adequate safety for infants. This increases demand for baby car seat during the forecast period from 2018 to 2026. Additionally, changing lifestyle in developing countries has encouraged the adoption of convenience-oriented routines, making baby convenience products desirable, which is likely to increase the usage of baby car seats. This, in turn, is expected to fuel the market. However, the lifecycle of baby car seat is short. This thus is a major restraint of the global baby car seat market. Furthermore, the demand for baby car seat is expected to increase due to the rise in global population and increase in urbanization. The baby car seat market has been segmented based on product type, distribution channel, and region. In terms of product type, the market is further divided into infant seats, booster seats, combination seats, and convertible seats. The booster seats segment accounted for the largest share of the market in 2017, followed by convertible seats. The segment is projected to expand at a considerable pace during the forecast period owing to the rise in adoption of these baby car seats. Based on distribution channel, the market has been bifurcated into online distribution channel and offline distribution channel. The online channel segment is anticipated to expand at the rapid pace during the forecast period owing to the rise in Internet penetration across all regions. E-commerce websites provide products to the customers at their doorstep along with several other facilities. This is increasing the popularity of online platforms among consumers. Online distribution channel is an excellent platform for new parents, as it reduces their shopping efforts. Stringent government laws regarding the use of baby car seats has increased demand for these seats over the last few years. These factors are likely to drive the global baby car seat market during the forecast period. Based on geography, Europe dominated the global baby car seat market with more than 30% share in 2017. The region is expected to continue its dominance during the forecast period, followed by North America. The U.S. dominates the baby car seat market in North America, followed by Canada. Stringent regulations regarding children’s safety and rise in the number of car accidents involving children are likely to drive the baby car market during the forecast period. Some of the leading players operating in the baby car seat market are UPPAbaby, Renolux France Industries, RECARO Holding GmbH, Newell Brands Inc., Mothercare plc, KiwiBaby, InfaSecure, Jane Group, Goodbaby International Holdings Ltd, Dorel Industries Inc, Cosatto Ltd, Clek Inc, Britax Group Ltd, BREVI SRL, and Artsana Group. These companies engage in research & development activities, mergers & acquisitions, product innovation, and strategic partnerships and agreements with other firms across different regions to strengthen their foothold in the market. For instance, The Mothercare plc’s Corporate Responsibility 2020 ambition to unite with parents to create a better world for the future of the children has been developed to be consistent with and supportive of the company’s vision. For the purpose of the study, the baby car seat market is segmented as below.